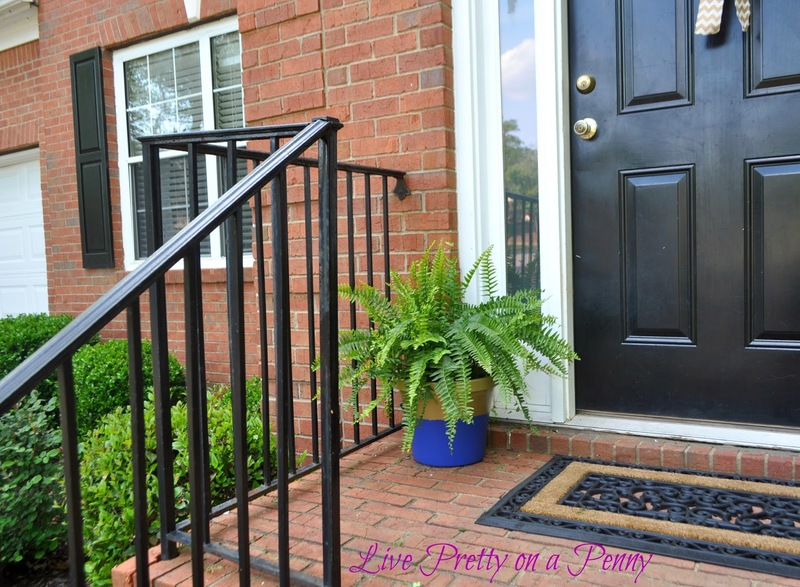 Each year, I plant Boston Ferns in the plastic flower pots on my “porch,” and each year I have been fine with the look that they have given. 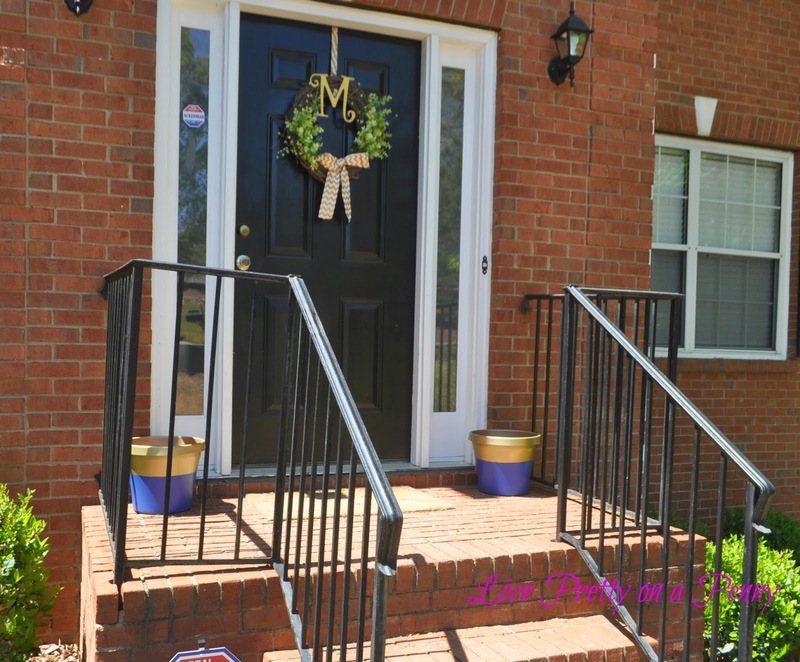 For some reason, this year, the plastic flower pots just seemed….well…blah. This year I wanted more color! Enter gold spray paint. I knew that I wanted something chic, yet colorful and fun. 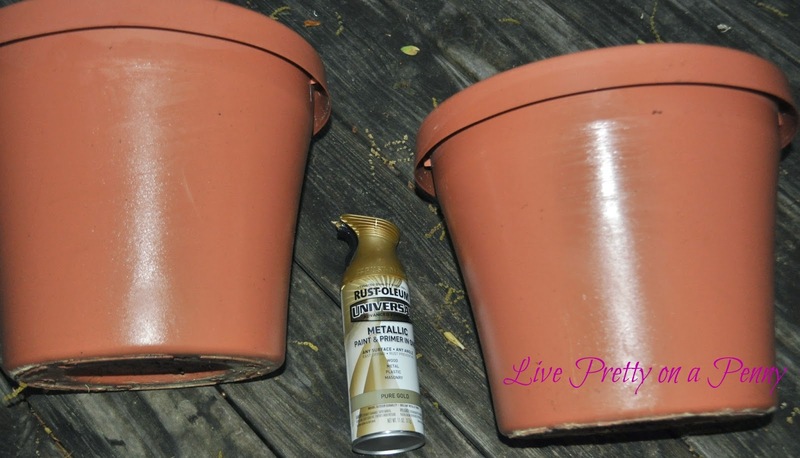 First, I wiped the pots down, then sprayed them Rust-oleum Universal All Surface Gold Metallic Spray Paint & Primer in one. I used this spray paint because I needed something that would adhere to plastic. Most spray paints don’t. I mostly covered them, however I knew that the bottom would be painted, so I didn’t make it perfect. After the pots dried, I taped off a little above half with Frog Tape. Then I painted the bottom using the same paint that was used on the baby’s dresser in his nursery- Behr Dark Cobalt Blue. 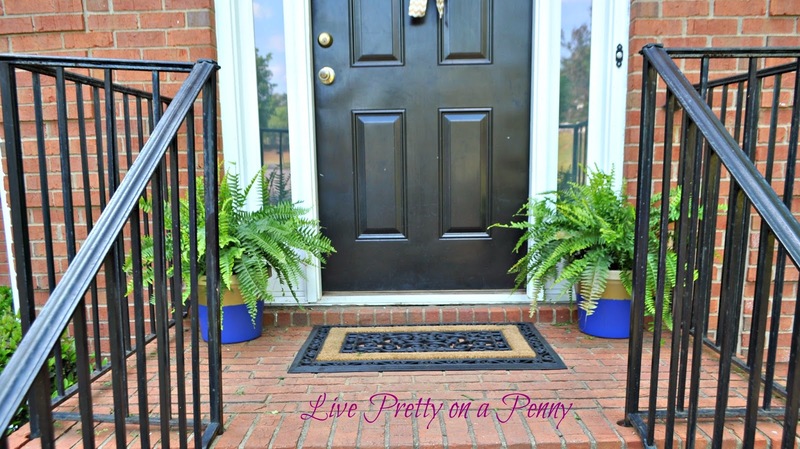 Here are the pots with Ferns that I purchased from The Home Depot for $10 each. I purchased Ferns last year and they did really well. They are very low maintenance and lasted until our first big frost. So happy with the cheerful pop of color that these pots bring! 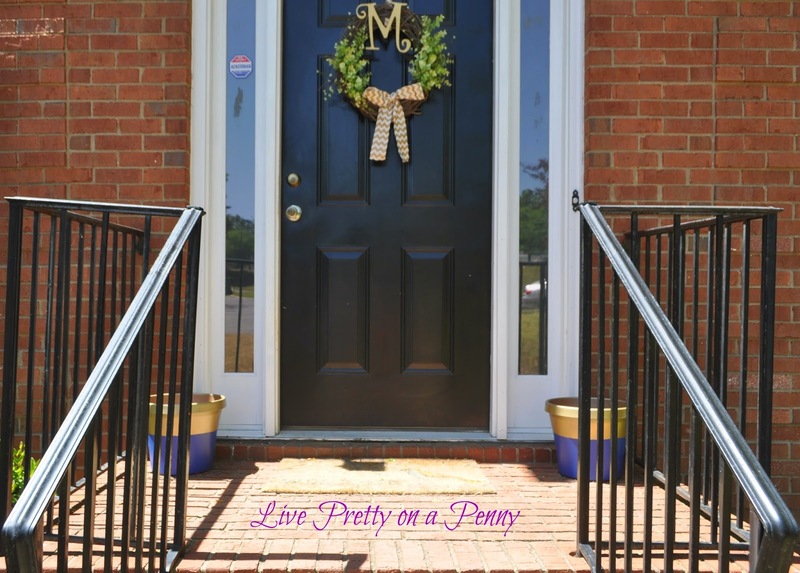 Oh, and if you follow me on Instagram, then you have seen a sneak peek of the wreath that is on the door. That was a DIY project and it will be on the blog later this week. So what do you think? 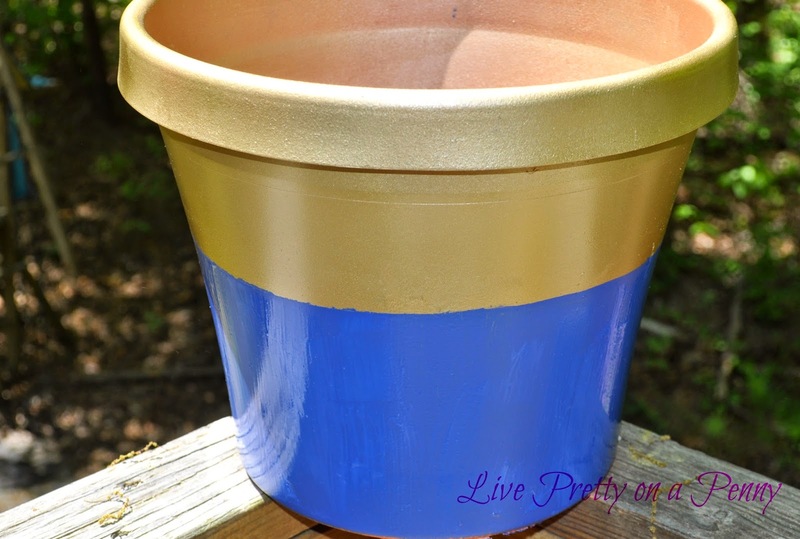 Have you ever painted any flower pots? 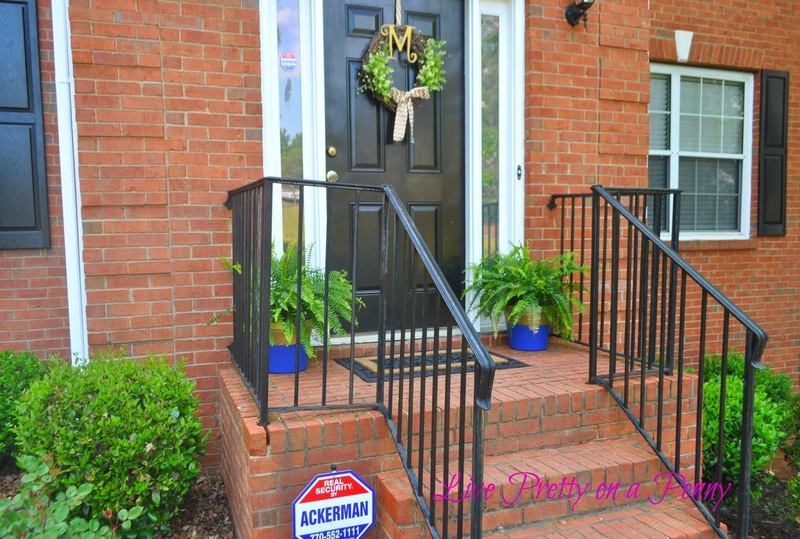 Overall, it was a pretty easy project and I am love with the impact that it makes on the porch! This makeover led me to purchase a new welcome mat from Target as well. Couldn’t keep that same old dusty one. Boo! Until next time. Thanks for stopping by! Looks great, Erin! Oh the power of paint. I love that you were able to use what you had. Based on your review I'm thinking I may need to try a few Boston Ferns too. I never really had much luck with them in the past. I'm going to try them in full sun like you mentioned. Great makeover! 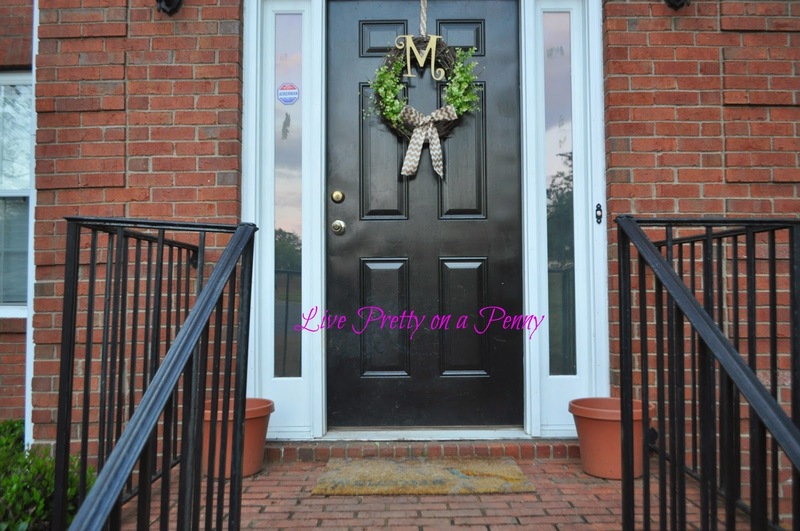 This looks really great Erin, I love the wreath, I might have to copy you on that one, lol! Oh, what pretty flower pots. I love how they turned out. 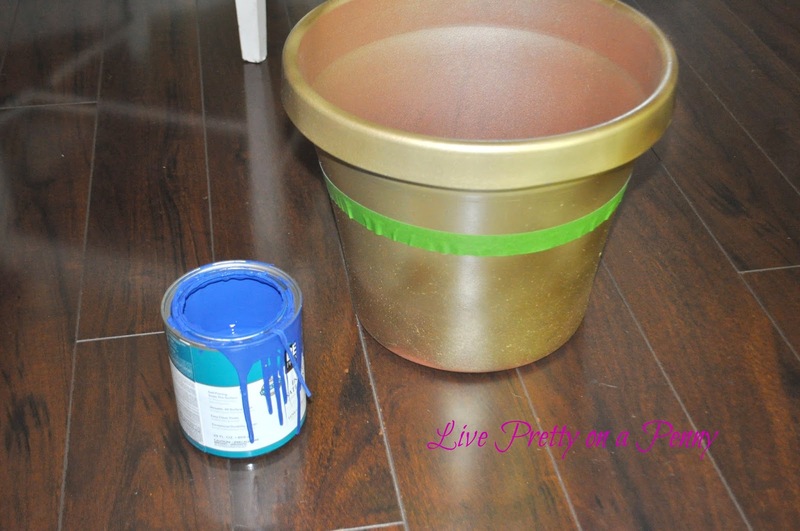 I've never painted flower pots before, but now I want to try. I love the wreath, too. Thanks Dee D. I am very happy with how they turned out. And what a lovely impact they make. Thank you Tonya!! Your comment was really sweet. that's amazing that those plastic pots are still holding up! i got new ones, stronger good ones, last october and they've cracked from the winter. ugh! i looove ferns, though i hear they are temperamental?? Looove the pots! I'm also painting some too. Great minds think alike! Erin, This looks really great, keep up the good work… I would like to read more from you have a good day.Best RegardsPlants PlanetA source of plastic pots for home and nursery use.